From the planning phase to execution, we'll help you host a fabulous event. Jennie is dedicated to providing the best experience for her guests by ensuring that the quality of food and service, as well as the atmosphere, is always stellar. She makes sure that all of the events hosted at Cover 3 Round Rock exceed the guests expectations. 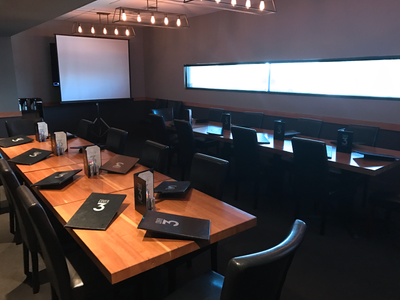 COVER 3 Round Rock boasts two casually-elegant event spaces, each of which feature comfortable leather chairs, contemporary chandeliers, and flat-screen TVs. The North Party Room accommodates 30 guests. The West Party Room accommodates 20 guests. There is not a flat fee for the space however we require a food and beverage minimum. All food and beverage purchased from your event space will go toward meeting the minimum. Food and beverage minimums vary by specific date and timeframe. For details and availability please contact your Banquet Coordinator, Jessica.